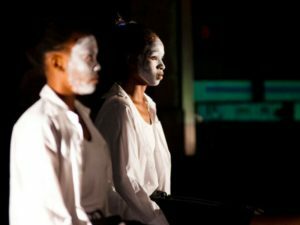 Amaqhawe, by Sibonelo Dance Project. Image supplied. Unlike the rest of the whooping audience, I was unmoved by Amaqhawe. People who have read my writing can gather I’m a ‘give-an-artist-the-benefit-of the-doubt’ kind of reviewer/critic (whatever you like to call us people). But, disappointingly, the negatives outweigh the positives in Amaqhawe and there’s no way to spin it otherwise. The content is important, no doubt. In one preachy speech we hear it all. The dance work is openly political. The “land question”. SAPS discrimination against what type of protesters get protection (whites protesting Zuma) versus violence (blacks protesting at universities, for municipal services, and Marikana). Students locked up for protesting for the right to education. And other current topical politics. The political issues are dealt with too literally. Not only in the speech, but in ‘actions’ such as the dancers miming carrying large guns and firing shots. In any other context I’ll be whooping too, to rousing, revolution-inspiring, anti-government rhetoric. But not in the theatre. If you preach to me, you lose me. We have the theatre space for finding creative ways to deliver these messages. To move people to action (we hope) rather than tell or replicate what we see on the news. In this ‘telling’, the dance vocabulary becomes obvious and shows the audience what frustration or fear or anger looks like – in swinging arms flung backwards, fast barrel roll jumps, dramatic slides across the stage, dancers lifted in the air with their legs thrashing about. These dancers work tirelessly throughout one hour of mostly frantically fast movement in unison. Except, the unison wasn’t in unison. Here, I’m willing to give the dancers the benefit of the opening-night-nerves-in-a-new-space-on-the-main doubt… but otherwise, this choreographic device loses its potential power when not executed properly. The movement vocabulary style (not the pattern of movements themselves) becomes repetitive as though the particular track playing must be danced to the end. And being about five tracks too long, whatever impact might have been delivered initially, wanes. The music is a great selection – despite being thunderously loud – I’d buy the soundtrack, and many bodies were dancing in their seats. The Great Hall’s lighting rig is impressive and it’s well used by the designer. There’s a smoke machine on overdrive, and combined with emerald green lights and a thumping beat – I see how it’s easy to get caught up in the spectacle. But. Without all these bombarding bells and whistles, would the dance stand strong? My sense is no. I have enjoyed Sibonelo Dance Project’s work before and I’m sure I will enjoy their work in the future, but Amaqhawe misses the mark this time. Amaqhawe is on today (01.07) at 12.00 & 18.00. Click here for bookings & more information.